I’ve been thinking a lot about clutter lately. The mad cleaning frenzy before relatives come to visit will do that to a person. Like many people, we struggle with clutter. We have some areas that stay in shape and others that don’t. I think one of the tricks for us is having a designated spot for things. It’s not that we’re too lazy to put things away, it’s that we’re too lazy to *think* about it before doing it. When something’s been left on the table, if it has a designated spot elsewhere, the only brain power I need to conjure is to realize it’s out of place and needs to move to spot X. I can easily do that as an overlap with other activities and barely think about it. If I have to stop and make some sort of decision about an item, that’s where I get bogged down. Junk goes in the recycle bin. I can usually have all those pieces pulled out before I walk past the recycle bin on the way back into the house. Bills go in a specific spot next to my computer. About once a week I pay them all on-line. More later on how I file the paid bill statements. Financial statements go in another spot on my desk. More on those later. Items to shred go in a box on top of the shredder. About once a week those get shredded. Personal mail for me or my daughter or things that require more attention than I have at the moment go on my computer chair to be dealt with the next time I sit down. Personal mail, including magazines, for my husband go on his computer chair. Mail order DVDs go on top of the TV if they are mine or on his computer chair if they are my husband’s. Magazines of general interest go on the coffee table. Manufacturer coupons go to my couponing area for filing. Coupons for free items go straight into my portable coupon organizer since they don’t need to be matched to a sale. Retailer coupons, fliers, etc. that I want to keep “for awhile” go into my rotating three-folder system. It sounds like a lot of shuffling, but we only get a few different types of mail on any given day, and the floor plan of our house is such that the destinations are all fairly close together so it works for us. The three-folder system for certain items is what saved us from having paper everywhere. I have three file folders. One is labeled “Jan, Apr, Jul, Oct”, another is “Feb, May, Aug, Nov”, and the last is “Mar, Jun, Sep, Dec”. Anytime I get a piece of paper that I intend to keep only for a little while, I stick it in that month’s folder. At the beginning of each month, I quickly flip through the folder for three months back and purge everything in it. For example, at the beginning of December, I’ll purge the September materials out of the “Mar, Jun, Sep, Dec” file. The materials have been in the folder at least 60 days so most are beyond their useful lifetime. Anything that has a little more life to it stays in the file for another three months. I started this system to catch mail such as a 30% off coupon for Kohl’s or packets of restaurant coupons. I wanted to keep those things and be able to find them, but I didn’t need them immediately. The purge for most of those items goes quickly. For example, the packets of coupons are old enough that they can get discarded without checking individual expiration dates. The system’s worked so well, I’ve included other papers such as postal receipts that I want to keep until the item has been received or store receipts I want to keep until I’m certain the item won’t need to be returned. If I need to retrieve anything in the folder, it only takes a few minutes to flip through the items to find it. I had a revelation several years ago. Simply this, I don’t have to separately file all the bills or statements that I want to keep. I used to worry, for example, about filing the newest phone bill with the others in chronological order separate from all the gas bills. I realized I was wasting time with an unpleasant task. I now have three stacks in a letter sorter on my desk. One is paid credit card bills, one is other recurring bills, and one is financial or asset-related statements. If I need one of those items later, it’s easy to flip through the short stack to find what I need. At the beginning of the year, the bills get bundled together, labeled, and tucked away in a box in the basement. The bundle from two years ago get shredded. For example, in January 2012, I can shred the 2010 bundle of credit card and other bills. 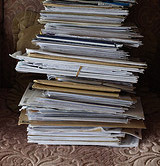 This system results in me keeping the bills longer than the generally recommended three months, but it makes for quick and easy filing and purging. At the beginning of the year, I go through the financial bundle to pull out anything relevant to our income taxes and to shred monthly statements for accounts that issue a year-end statement. The bundle then gets labeled and tucked away in the basement. But what to do about personal mail? I feel pretty good about how mail gets handled with one exception. I am unwilling to throw away any personal correspondence. For example, I have every letter or card my mom sent me since the time I left for college, but they aren’t in a state where I can really enjoy them. Someday I hope to figure out the right solution for that. This entry was posted in Organization and tagged bills, mail, paperwork, sorting. Bookmark the permalink.